Bike race podiums across America welcomed Raleigh-Clement riders during an extraordinary year for the team. 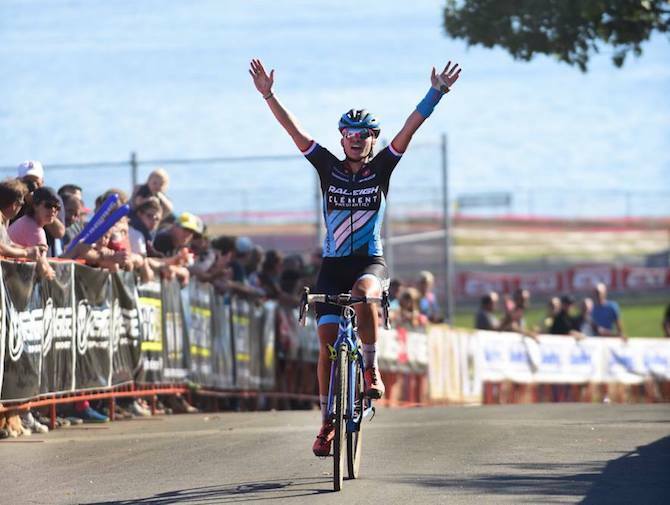 In May Jamey Driscoll directed his Raleigh RXC Pro Disc across Arizona desert and Illinois corn fields to wins at the Chino Grinder and Gravel Metric. 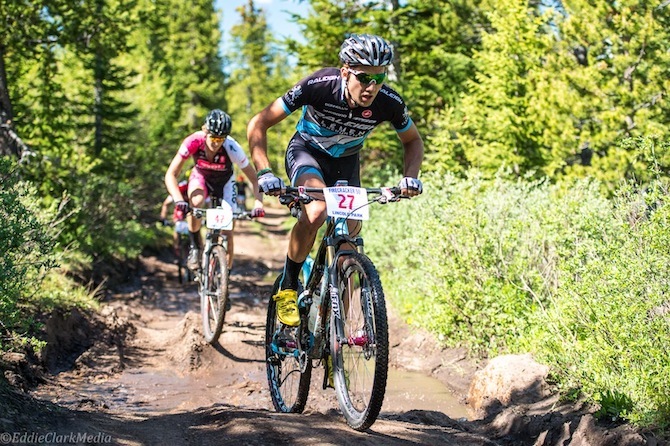 He then turned his attention to the singletrack with his Full Suspension Skarn mountain bike and rode to the top podium step at the Firecracker 50 in Colorado. Ben Berden and Caroline Mani sweated out long gravel race and mountain biking miles too. The petite Mani shredded on a custom 27.5 Ziva mountain bike. Then the team launched into a cyclocross season with a full head of steam, and never looked back. 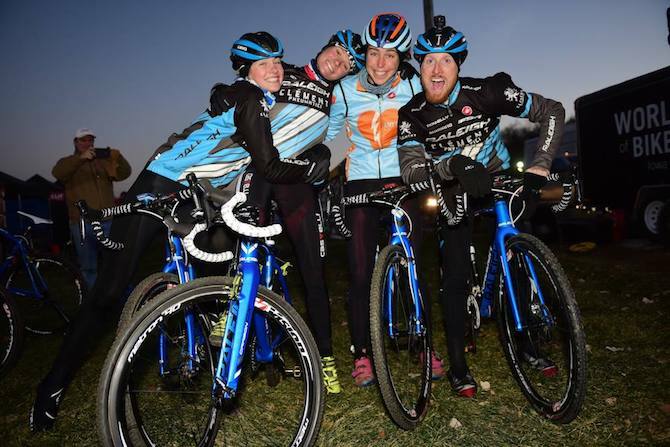 “Without a doubt, the Raleigh-Clement Professional Cyclocross Team was the most consistent and winningest team in America this year,” said team manager Donn Kellogg. Mani and Berden began the ‘cross podium journey mid-September with two second places in Boulder. After second and third in Madison, Wisconsin, the French rider was diagnosed with a broken wrist. Initially the stellar season she ached for seemed out of reach. “Fortunately I had the right doctor. He helped me follow my dream and I raced with pain but with determination,” Mani recalled. Just one week later she crossed the finish line first near the beach at Gloucester, Massachusetts, cast and all. Then in mid-October, at Full Moon Vista Cyclocross in Rochester, New York, Mani won against adversity two days in a row. All season long Caroline has been piloting a prototype for a women's specific ‘cross bike, that should see production in 2015. “Raleigh did an amazing job with this bike,” she said. “It is really women-specific and I will tell every woman who is not convinced that it makes a huge difference for us.” Mani loves the bike’s handling and how the lower bottom bracket and smaller tubes facilitate jumping on and off the bike. “I trust my Raleigh bike and I know I have the best tool to get the best results,” she added. While Mani’s wrist continued to heal, she continued to achieve top three results as she shared her wisdom with two younger riders who balanced out the male to female ratio on the team. Eighteen year-old Laurel Rathbun recently raced to 2nd place, her best career-to-date result in a UCI elite race. And the first Amy D. Racing scholarship rider, Erica Zaveta, raced alongside the Raleigh-Clement cyclists this year. She rocketed to her first UCI cyclocross victory in late October when Mani landed on top of the USA Cycling cyclocross calendar women's standings. At the same time, Driscoll secured his first big 2014 ‘cross win in St. Louis. He quickly peeled off wins in Iowa and Kentucky, and then doubled-up in Los Angeles. The crafty veteran Ben Berden is not one to be outdone, as he found himself on the winning side on the first day of the November race in Iowa. Craig Etheridge took his seventh UCI win this year in the single speed category at December’s UCI race near Seattle and Raleigh Bicycles America’s headquarters. Berden and Driscoll claimed elite wins there. Driscoll, also known as “The Wolf,” now leads the men’s USA Cycling cyclocross rankings. 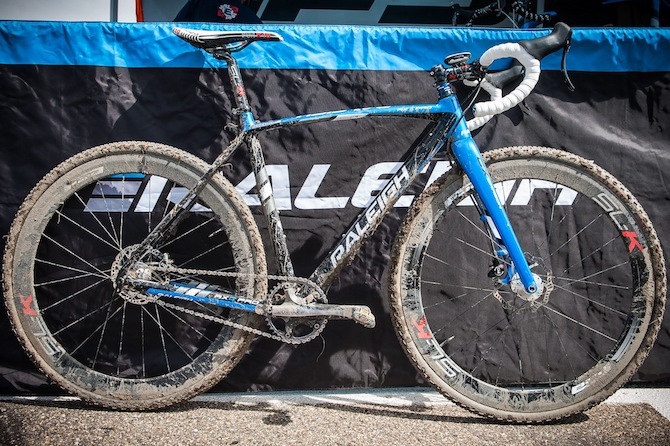 He’s noticed improved performance from this year’s Raleigh RXC Pro Disc model. “The bike’s more compliant overall. On really bumpy courses it’s taking a lot of the abuse instead of transferring it to me.” Driscoll also mentioned the new thru-axles; they have added stiffness and responsiveness for more stability in the corners.